We attended the Northwest Tea Festival October 2 & 3 at Seattle Center. I love these little ceramic cups they handed out for tasting. The tall glass object is a tea brewer. It is double insulated so the outside stays cool. 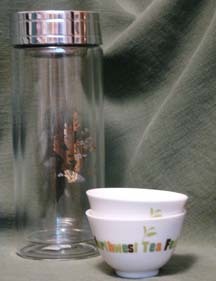 The snap-in mesh insert on top keeps the leaves out of your cup. Pour out the tea and re-fill with hot water to brew multiple cups. The Northwest Tea Festival is smaller than the Victoria Tea Festival with fewer vendors and not as many food samples. Many of the area tea rooms were missing. We heard an engaging lecture on the teas of Taiwan and tasted our way through a sampling of Japanese greens.